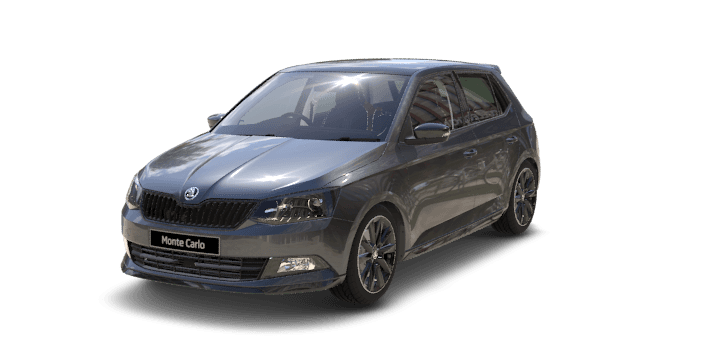 Fabia Monte Carlo provides the perfect blend of sporty aesthetics and striking design. It is highlighted by its black design elements such as 17” black alloy wheels, black front grille, black door mirrors, sports seats and panoramic glass roof. Features such Front Assist with City Emergency Brake, SmartLink smartphone connectivity with Apple Carplay and Android Auto, rear view camera, Multi-Collision Brake and Green Tech (Start-stop and brake energy recuperation) as standard across the range. The award-winning ŠKODA Fabia has more value then ever before. Featuring the very latest in Volkswagen Group technologies and safety advancements, the versatile Fabia includes SmartLink^ Smartphone Connectivity including Apple CarPlay® and Android Auto™, Rear View Camera*, Front Assist with City Emergency Brake*, Multi-collision Brake and Green Tech~ all as standard across the range. The Fabia has also been recognised by Carsales as Australia's Best First Car, awarded 2 years in a row. Offered as both a hatch and wagon, the Fabia focuses on sharp and angular lines. View it from any angle and its perfectly balanced proportions won't fail to impress. The Fabia hatch also offers optional Colour Concept combinations, allowing you to customise your Fabia to express your personality and style. Some forward thinking for when you’re going backward. A rear view camera◊, standard across the FABIA range, helps you back out of your driveway with peace of mind and tackle those tricky reverse parks with confidence. The last thing we want to happen to you immediately after an accident ─ is another accident. Electronic Stability Control (ESC) helps you maintain control of the car if it begins skidding, while Multi-collision Brake◊ activates the braking system to help minimise any future collision. ◊ Safety technologies are not a substitute for the driver’s responsibility of the vehicle. Our clever engineers have developed a hands-on approach to help identify driver fatigue. Fatigue Detection∆◊ monitors your movement through the steering wheel. If it senses signs of fatigue, it sends an audible and visual warning, alerting you to stop and rest. ∆Included in optional Tech Pack. ^^SmartLink is compatible for selected apps with the latest smartphone versions of iOS and Android. Just when you thought cruise control couldn’t get any smarter. Adaptive Cruise Control (ACC)◊∆ features a radar sensor on the front grille, allowing it to automatically brake and accelerate to a speed and distance set by you. Oh, did we mention it comes standard? âˆ†Included in optional Tech Pack. You know what else sounds great? Every FABIA MONTE CARLO Hatch features ŠKODA Surround Sound, developed in collaboration with leading audio brand Arkamys, with six speakers as standard, a unique acoustic compensation system, and a Virtual Subwoofer to enhance digital audio. A car that gets the door for you? Now that’s service. KESSY∆ can be added so you can lock and unlock your car, and start and stop the engine without having to insert or even handle the key. The FABIA MONTE CARLO Hatch is packed with clever features for a rainy day. Light Assist automatically adapts to changing light conditions, while the Rain Sensor∆ automatically adjusts the speed of the wipers to light or heavy rainfall. Black won’t be going out of fashion any time soon thanks to the FABIA MONTE CARLO Hatch. Highlighted by its black design elements, such as the 17” alloy wheels, front grille and door mirrors, it also features a panoramic glass roof with a sunshade to deliver plenty of daylight into the interior. The front spoiler, rear diffuser and tinted windows all add to its sporty appeal. We couldn’t call it MONTE CARLO without giving it plenty of racing touches. Sporting enthusiasts will enjoy bespoke sports seat upholstery, sports pedals and carbon-design dashboard inserts. Then feel the difference of the three-spoke, multifunctional, flat-bottom sports steering wheel upholstered in perforated leather, appointed with red stitching. You’ll be surprised by the amount of grunt we’ve packed quietly under the hood. Modern turbocharged engines with direct fuel injection ─ petrol TSI ─ save fuel while retaining driving dynamics. And thanks to the turbocharging, there’s plenty of power at low RPM, where the engine is most commonly used. When you buy a FABIA MONTE CARLO Hatch, you’re making a smart choice — for yourself and the environment. Green Tech~, standard across both petrol variants, features “Start Stop” and Brake Energy Recuperation. "Start Stop" automatically switches the engine off when stationary and starts it again when you want to drive off. ~Reactivation of "Start Stop" will not occur in certain conditions.